Last Tuesday night, Rich was at the school coaching. He had ignored some warning signs that something was not quite right in his groin area but as usual, being the man he is, he kept on going strong. He was wrestling with the heavyweights as he’s been taking a ‘hands on’ coaching approach and it happened to be Jacob that he was working with at the time – on the mat with him wrestling with his usual aggression and speed. Unfortunately for him, his groin finally tore with a vengeance and he was left hurt on the mat, stunned, shocked, and thinking only of the pain. A day later, as he attempted to limp through his work schedule and not go to the doctor’s, he noticed a bulge had appeared. He spoke with the other coaches, the trainer, our doctor, a specialist, and was advised by all to go to the hospital to get it checked out. After coaching Thursday night’s meet, and watching his son Ethan finally win a match, he drove himself to the hospital. The next morning, I drove through a snowstorm to join him. Six of our children were at school, and I took Sarah with me, believing with all my heart that hernia-repair surgery would only take a short while and I could go home in the evening. 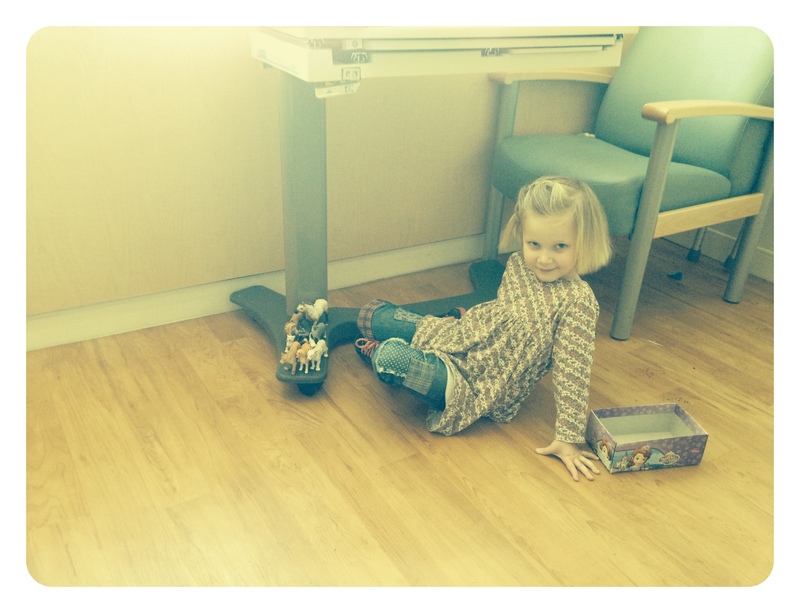 Sarah was a comfort and joy to us that day as we watched her play with her box of animals. The kind Jamaican nurse brought a blanket for her to play on so she didn’t have to sit on the floor. We spent the morning together, just the three of us, and then at noon they wheeled Rich to the operating room. No one in our family has had to have surgery (other than teeth being pulled). I wondered how he would manage and hoped there would be no surprises. 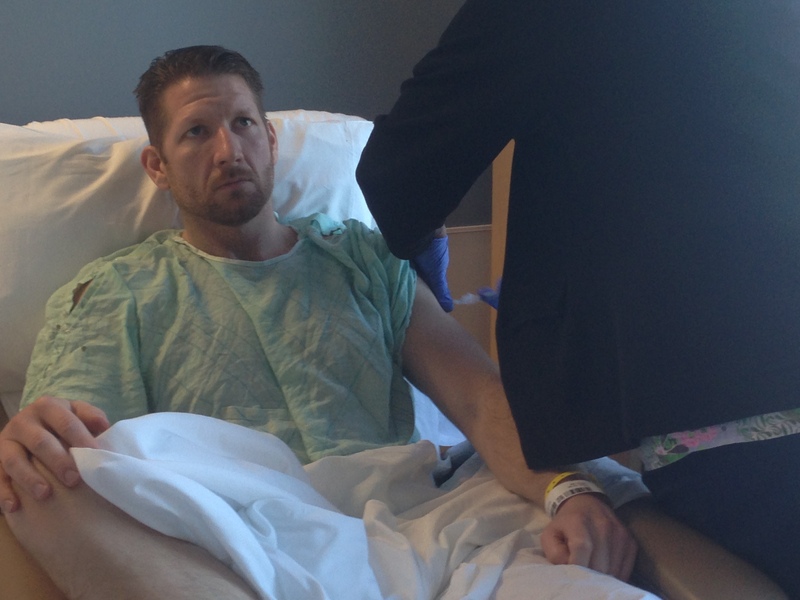 It was a relatively minor injury and surgery compared to what it could have been, so we were at peace and thankful. Sarah and I walked around together and an hour and a half later the nurse called to tell me they were just about ready for surgery. This was a surprise to me because I thought he would have been almost done by then. This showed me how clueless I really was about surgery. Even a minor surgery can be an all day affair. 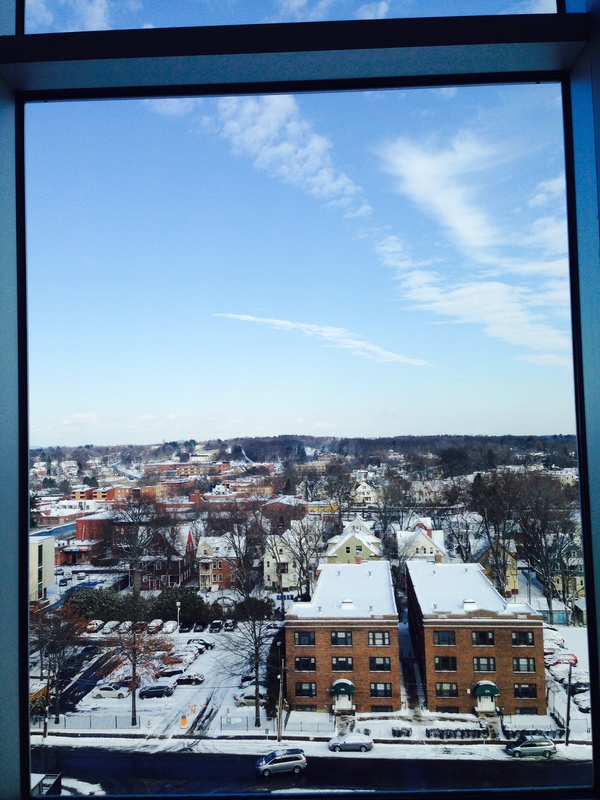 The view from the 9th floor. I took Sarah to the cafeteria for lunch. We ate together in waiting room while she watched PBS cartoons on the TV. After lunch we walked to the gift shop where I purchased a paperback mystery and a soft gray wolf for Sarah. She promptly named it Soft Paws and is still carrying it around in her arms even this morning. I don’t like hospitals but I thought it was important to make the experience as pleasant as possible for Sarah. The doctor eventually called to tell me that the procedure went fine and that Rich did very well. 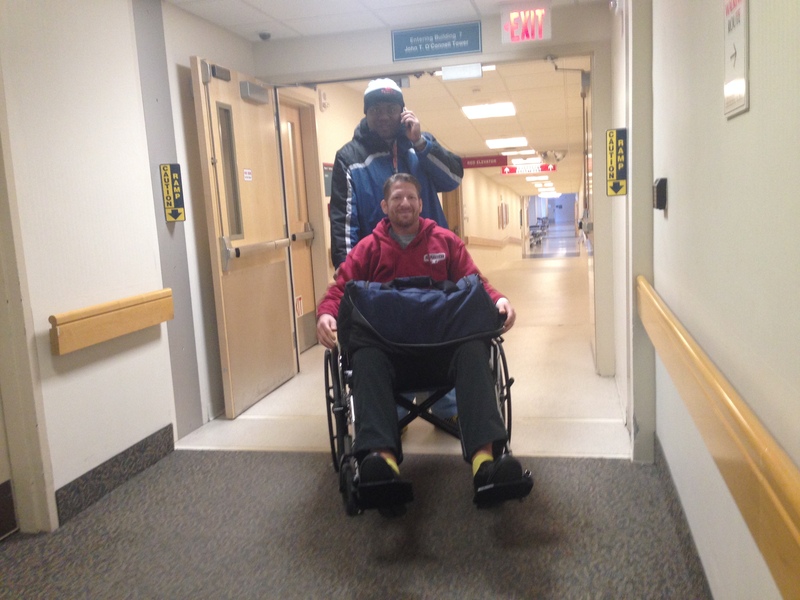 He let me know that the nurses would call me when he was taken back to his room, which would be another hour or two. I was in his room when they brought him back and Rich was very sleepy as he recovered from the anesthesia. He was talkative. His sentences were slow and his reaction time was very delayed. If I told him I loved him, it took him about 5 seconds for his face to melt into an understanding smile. He only wanted me, the first word I heard was my name, over and over (his eyes were shut). When he understood I was there he needed to know where his Sarah was and how the boys got home from practice that evening. He was thankful for all the attention from the nurses and was never gruff with anyone. Even full of drugs he used impeccable manners and would respond “yes sir” or “yes ma’am”. When they moved him to his bed he slowly lifted his arm to point to the stretcher. “I……like…..that……BOARD……better,” he explained to us, eyes shut. I eventually took out a pen and paper to jot down the funny things he said. We had a great time going over it the next day, laughing hysterically with Rich pressing a pillow to his side so it wouldn’t hurt as much. It soon became clear that he would be staying another night. He told me not to leave him, so I asked Isaac and Cassandra to get Sarah and take her back home. We spent the night taking a couple of naps as nurses kept coming in the room to check on Rich. We were glad when it was morning again and knew we would be going home. Rich’s liquid breakfast was hysterical. 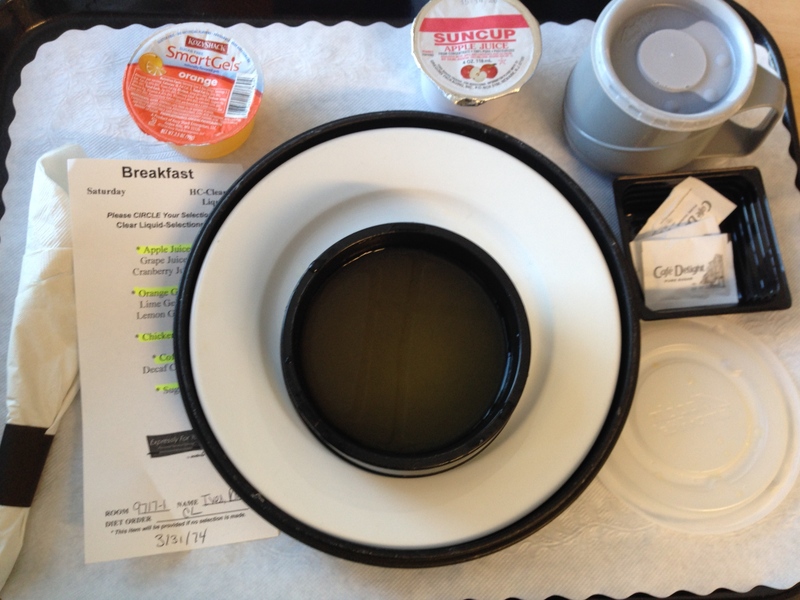 It was jello, juice, broth, and coffee. I happily took off for the Au Bon Pain downstairs for a breakfast sandwich and coffee. 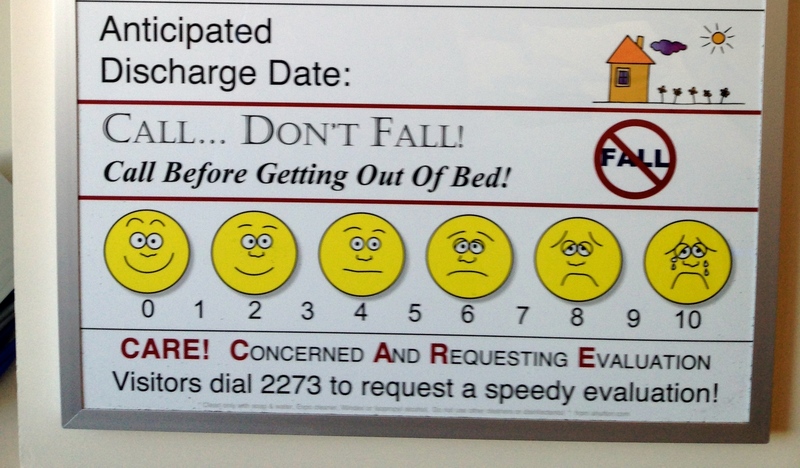 He told me that his pain level was a steady “4” because I made him laugh too much. I took that as a compliment. They say laughter is the best medicine, right? Getting stronger by the minute. 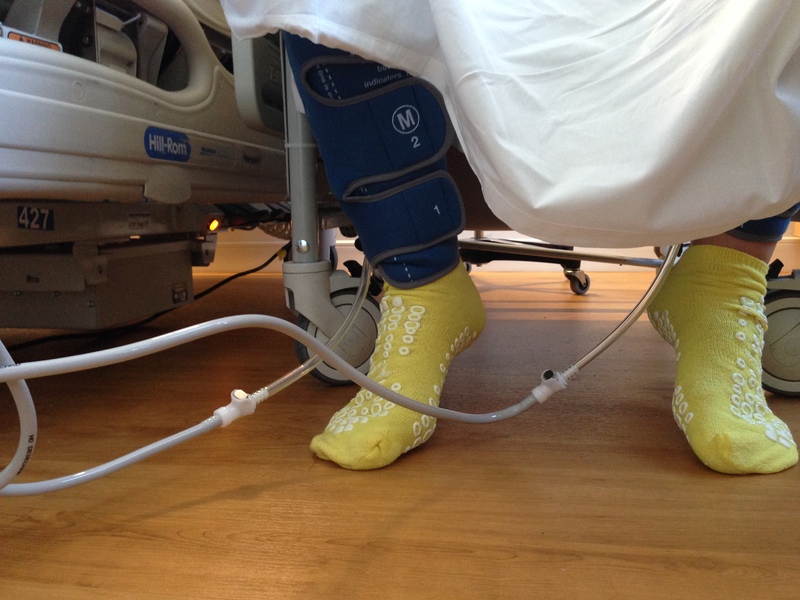 He wore things on his legs to help prevent blood clots. He admitted that he liked the hospital socks and thought they were comfortable. (He is a harsh judge of socks because it is so hard to find nice socks for his big feet). I stirred up a package of Emergen-C into his water. 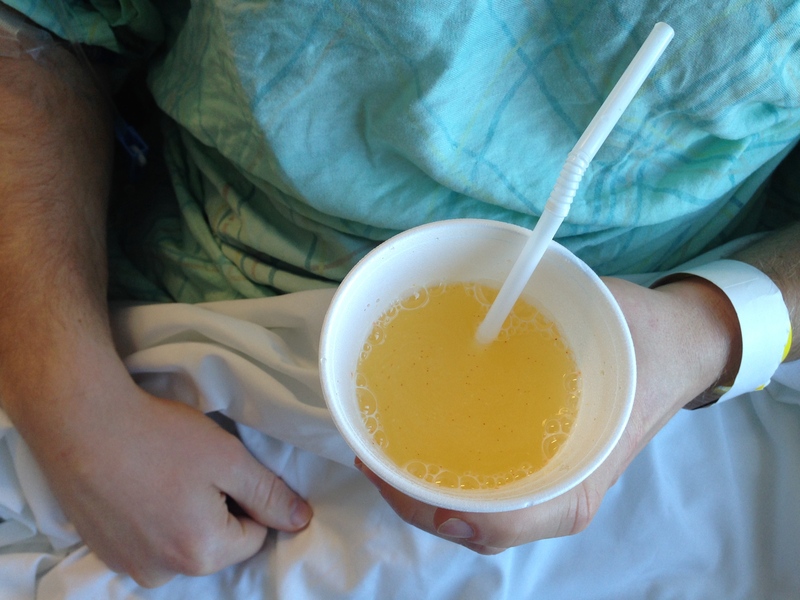 The nurses and I had to make him drink, he didn’t seem to understand the necessity of so many fluids. It was fun to take care of him. Nurse Sonia checked his vitals one last time. He truly was in great shape, with perfect blood pressure and an athlete’s slow pulse rate. His only complaints the entire time was his terrible groin injury and then the swelling of the hernia operation. There were no surprises, no complications, and we were so grateful. 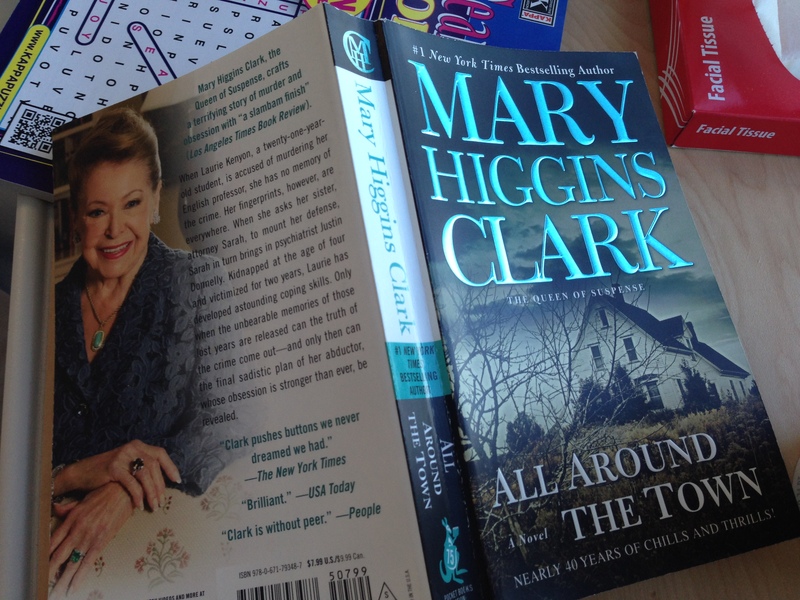 I read my very first “Mary Higgins Clark” mystery. It was a nice easy read to keep my mind half-focused on something besides hospitals, illness, injury, and death. Admittedly, it was a murder mystery, but it was entertaining and did a good job of holding my attention. 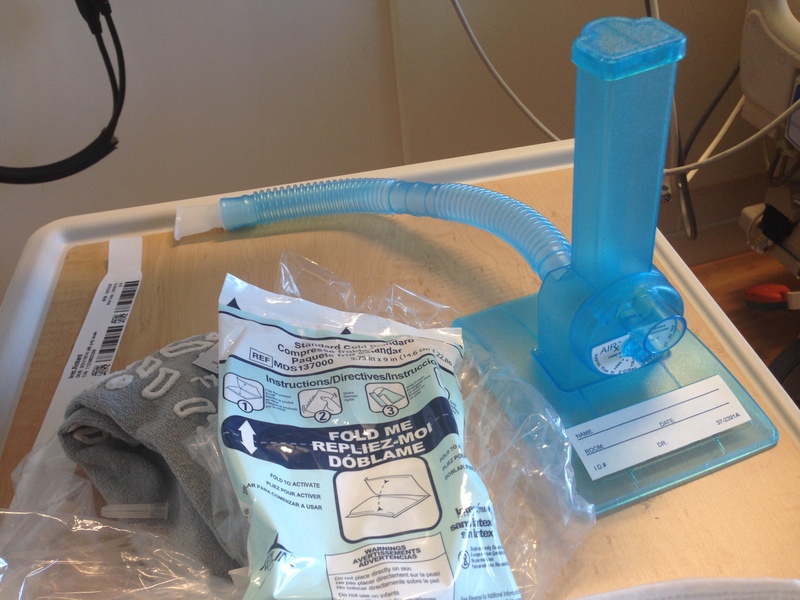 Rich had to breathe through this blue thing to exercise his lungs after surgery. I called it his peace pipe. He found a wrestling show on TV and it helped take his mind of his shot. Dressed and ready to go home in a motivating t-shirt! Before I forget, I want to take a moment to write how thankful we are for Nicole P. She drove the boys home from practice, and took them to the school Saturday morning for their tournament. She also brought them home again. Brett W. and Mike P. were a huge help in coming to the hospital so that Mike could drive Rich’s truck home. Brett and his wife Jen also had our son David overnight. My friend Caroline K. also helped with getting Grace to school for singing, and she also took care of the little boys until Jacob and Ethan were home. Mike helped with taking care of things at home and kept everyone’s spirits up. We are thankful for our cherished children and their help and encouragement. Our brother in law, Jason, went to the boy’s wrestling tournament to “stand in the parenting gap” and sent us frequent updates and pictures. And, of course we were touched by all of our friends and family who called and prayed. We love all of you so much! Thank you from the bottom of our hearts. Today we are all home together. The children have a snow day and Rich is doing what he can to work from home. Happy Monday, my friends! You are loved. This entry was posted in friends, life with boys and tagged groin injury, hospitals, myhusband by Shanda. Bookmark the permalink. Shan, I adore you and your precious family. You are a warm, kindred spirit. 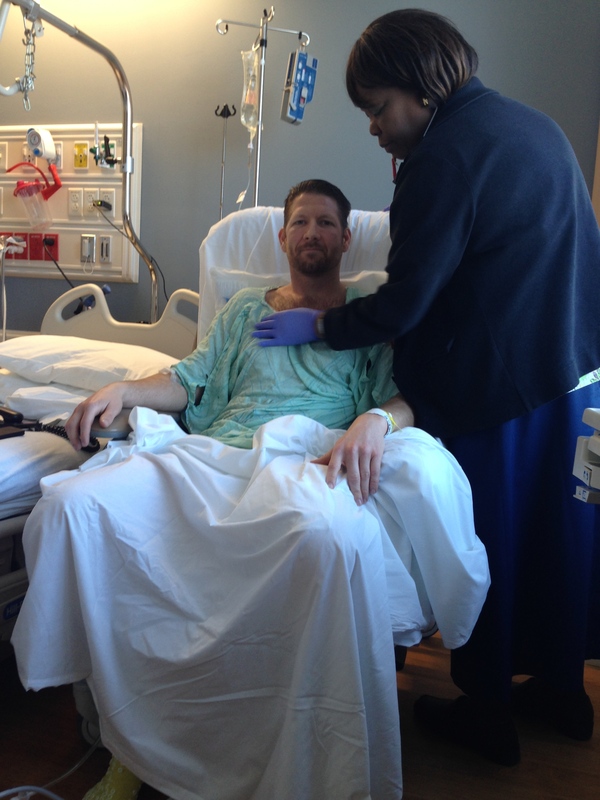 I am thankful that Rich’s injury and surgery were “mild” and he is recovering well. I am certain he is grateful for the attentiveness if his ever loving wife. Enjoy the day with all your babies and your man! Thank you, dear Eli. I adore you and your family, too. It’s been a nice morning so far….we made a little pot of chili for lunch, and some velveeta/salsa dip for chips. The boys are playing mine craft and Grace has her bunny hopping around the living room. Rich worked from home for a few hours and is taking a nap now. glad he is doing ok! What a deal! I often warn Robert now when wrestling with our boys to “be careful” to not get hurt. 🙂 Last night they were wanting to arm wrestle him and I thought – not a good idea considering “daddy needs to go to work tomorrow to earn for the family y’all!” (and not with a broken arm or something!) I love that our men like to stay young though and are hands on with their boys. Good thing. Here’s too well wishes and good healing. Yes, let’s keep warning our guys and hope for the best! Thanks for the well-wishes, friend! Blessings and love to you and your family! Hospital stays are not the most pleasant, but you guys look pretty cheerful 🙂 Those socks and blood clot bands look very familiar. I had outpatient gallbladder surgery recently, and I thought those socks were pretty nice and warm as well 🙂 Blessings to you as you take care of your hubby and hope he feels good soon! God gave so much grace. The only time I cried was Friday night after everything had settled down and I hadn’t had any dinner yet. After a salad I felt much better! Glad he is home and doing well. I’m glad to hear he did so well! Counting my csections, i’ve had 10 surgeries, so I know how that hospital stuff goes. I hope he’s recovered fantastically. I’m sure he’s so glad to be home with you and your crew. Oh my word, 10 surgeries! You are such a strong women, Beth. Thank you for the comment. 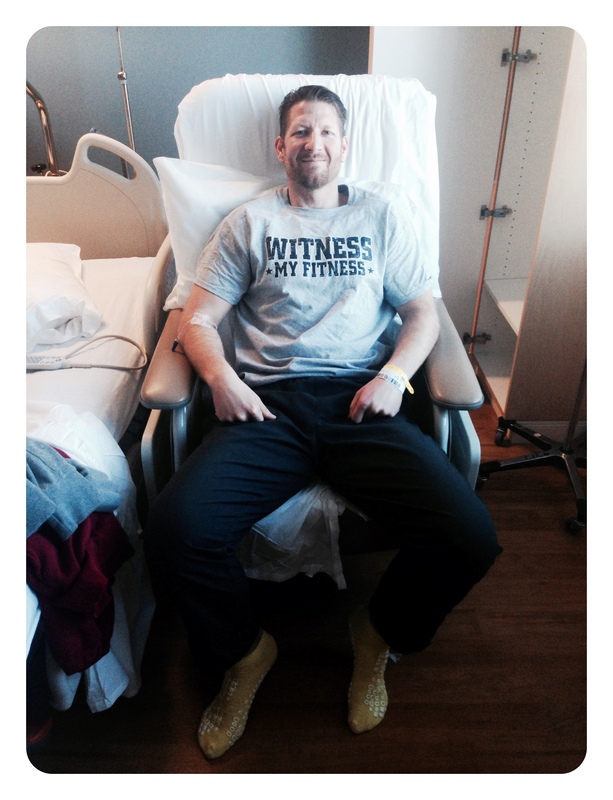 He is recovering fantastically…so far so good! I am sorry he had such an adventure, but am glad things went well and he is home where he can really get well again. I love the way you tell a story! So glad Rich is OK. I know it can be scary to have someone you love so much in the hospital, even when you know it’s not life-threatening. Oh shanda! Lol. Parts of me just laughed! 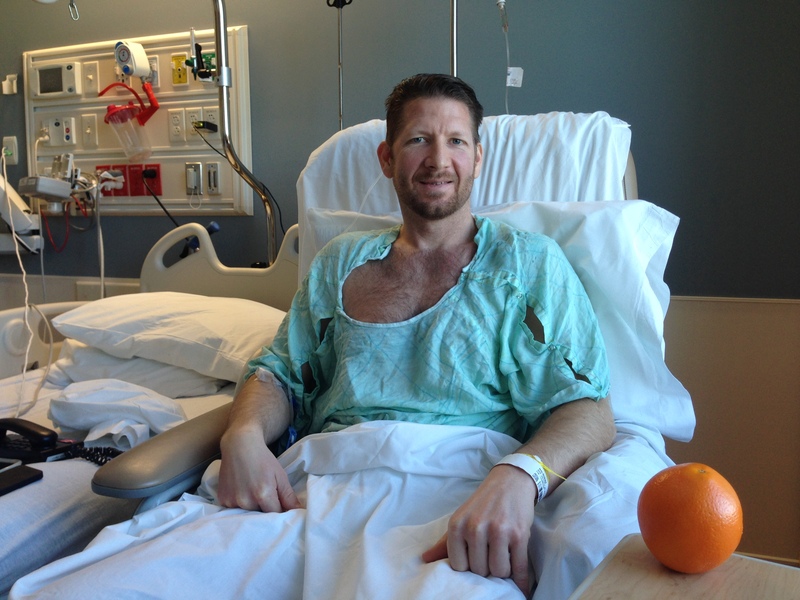 My husband had hernia surgery. Sounds like God was really taking care of you with the nurse, and things at home. So glad your Rich is able to go home! Take care. Hope he heals quickly and thankful for all who pitched in and the grace God gave you all through this trial. I told J that his current ailment of a scratched cornea is much better than what your husband had to go through. :). Love to you all. Glad all went well.My husband had surgery in September.He spent a week in the hospital.I thought that was long!Can’t imagine spending weeks on end at a hospital like some people have to. Oh, no! I’m so glad everything turned out okay, and that Rich flew through the surgery like a champ. Keeping him down to rest long enough to recover might be the bigger challenge, huh? 🙂 Praying that he has a quick and easy recovery! Oh my, Shanda, what an adventure, indeed! I can feel your heart’s gratefulness knowing that your Rich came through it all without any complications! 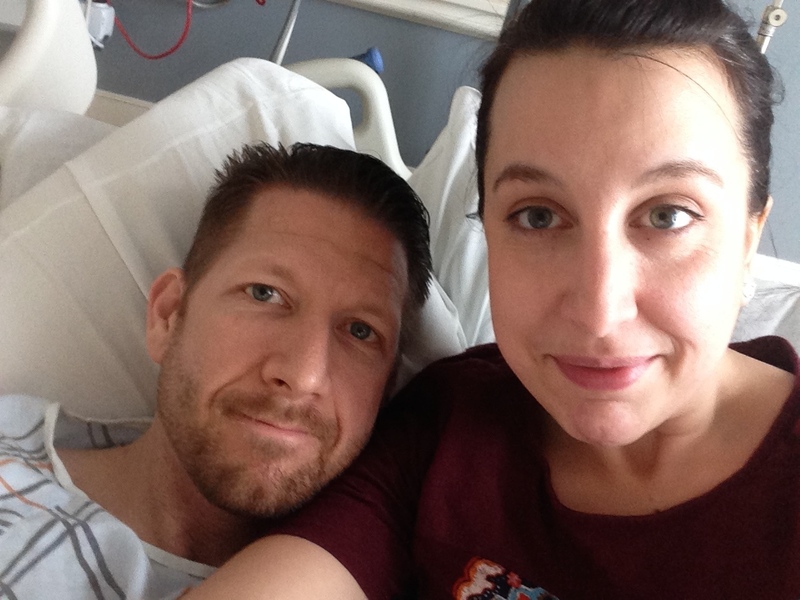 My husband went through the pain of a kidney stone … thankfully, no surgery was needed, but seeing him in the pain he was in was quite a concern to me! We love our men and don’t like seeing them so vulnerable, that’s for sure! What a blessing to have so many caring for, and helping, your sweet family! I’ll be praying for Rich’s complete recovery, my friend! ((Hugs)) P.S. And thank you for sharing that verse from Philippians … it was the one I needed myself, tonight! Blessings! Glad Rich is feeling better. Hospitals are no fun. It’s so neat how Rich is involved with his boys as much as he is. It’s so important for young men to have their dads around. You have such a wonderful family. I love, love coming over here and reading your posts. I just love it over here. You’ve been on my laptop since you posted this yesterday!